Travel with Kevin and Ruth! : Another animal stroked off the list! 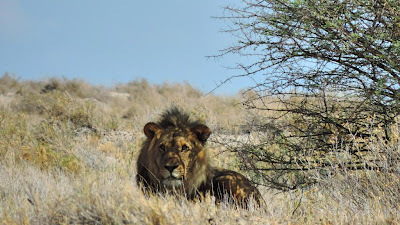 We did a bit of a longer safari drive through Etosha National Park on Friday morning. It started off really good, with a group of wildebeast crossing the road. And shortly after that, we saw a head stick up beside a culvert over the road. It was our second hyena sighting! We startled this hyena and rather than running back into the culvert, it ran out and away, and as we stopped to watch it, it seemed a little frustrated that it couldn't get back to it's daytime hiding spot. My lens is bigger than your lens! A safari tour group came by and one guy had this HUGE lens attached to his camera. Good for him, but we will never want to be traveling and carrying around that much equipment only to get those one or two shots that we are not able to get with our current camera gear. Doesn't seem worth the aggravation. 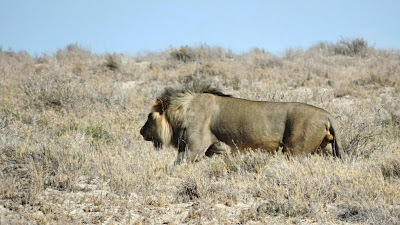 It was about twenty minutes later that we saw a group of springbok. There are a lot of springbok in Etosha...thousands. The tour group with the guy with the big lens stopped and talked to another one going the opposite way. You could tell there was some excitement, and when they started driving again they seemed to have a purpose. So we followed them! And good thing we did! We got there just in time to see this big fellow taking a walk to a shade tree, where he laid down about 50 yards from the road. Jackals, enjoying the lion's dinner leftovers. It is not all pretty pictures in Namibia's Etosha National Park. Unfortunately, the circle of life means that some animals will not survive so that others may live. The rest of our drive was uneventful. Here it was, our last safari in the park and we still had not yet seen a rhino or a leopard. There was still hope though! We relaxed again in the heat of the afternoon. Ruth went to the waterhole in the hopes of seeing rhino, and I went and had a snooze by the pool. It's fun to watch the ground squirrels. The middle one is a young one! Our evening plan was to sit by the waterhole. Although it's interesting watching the animals come and go, I personally appreciate the sightings more when I see the animals away from the viewing area. Too many other tourists for my liking and it seems more like a show than like nature. But it is still interesting. We sat for a while and watched the springbok and a few jackals. A couple of lions showed up again, but Ruth's date with a rhino didn't look like it was going to happen. She got stood up! So we went back at the campsite and had a look at our pictures for the day on the laptop. As we were getting things packed away for the night, Ruth says "let's go have one more look at the waterhole". I was tired, and didn't want to go, but eventually she talked me into it and away we went. It was after 10:30pm. And there he was. No, wait...there were two of them! We think they were black rhino, which is the rarest of the species. But our camera gear is limited and distance shots and night don't work out so well. Sure wished I was the guy with the big lens at that moment! But this is the best we could do. What a great way to finish off our safari's in Namibia's Etosha National Park. The only animal we really wanted to see but didn't get a chance to was the leopard. And we really didn't see as many elephants as we would have wanted to, but when you read the next post about our day on Saturday, I think we made up for it then! I laughed out loud when I saw that guy's lense. I've actually seen someone with similar use his wife's head as a tripod! Sounds like Ruth has a good gut feeling.My brother is like that. I suppose you can see it that you are only somewhere once and to do as much as you can. I remember that waterhole in Etosha and it was where we saw black rhino. It really is a unique place for viewing animals through the night. I think it's even got a live link so you can watch from all over the world. I get tired easily on safari and tend to rise early and go to sleep early. It just feels so tiring. Do you guys feel tired? It's interesting that you've got a list. It's great thrill to see a new animal or bird. Glad you got to see some close up too. Can this adventure get any better? Fabulous!!! Thanks for sharing those excellent pictures again,you guys sure are having a fun time by the sounds of it. 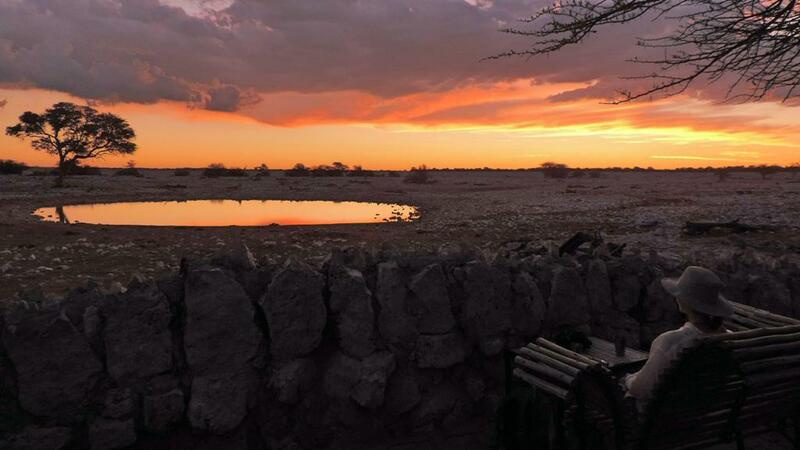 Great photos and what clairvoyance Ruth had about the water hole. Bet that guy with the huge lens is so involved with his camera, he probably misses a lot of educational opportunities by actually watching the animals! What a fantastic trip you're on, just amazing the wonderful animals you're seeing. A trip of a lifetime, for sure. This is so exciting that you have seen all these animals especially the Leopard and the Rhino. My best to you on your adventures! Spectacular photos - the elephant parade made my Sunday! Too cute! How in the world do you post those gorgeous header pictures with limited bandwidth. Hats off that is a fantastic picture. As is the rhino IMO. Way to go Ruth. Thanks!! Fabulous photos and what a great day. Tell us, is this the best ever??? Can't hardly loose at the waterhole. Nice lion sighting.